At the weekly sheep sale on Saturday, July 21st there was an increased entry of lambs selling to £91.00 and fat ewes to £90.00. 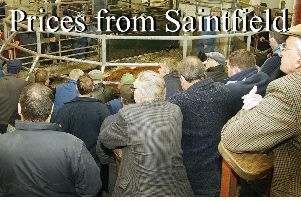 Lighter weight lambs sold to £3.53ppk. FAT LAMBS: Ballynahinch farmer 29kg, £91.00, Ardglass farmer 26kg, £87.00, Ballyalton farmer 26kg, £87.00, Downpatrick farmer 24kg, £86.00, Raholp farmer 25kg, £86.00, Comber farmer 25kg, £85.00, Castlewellan farmer 25kg, £85.00, Downpatrick farmer 24kg, £85.00, Ballycruttle farmer 24kg, £85.00, Rossglass farmer 24kg, £84.50, Strangford farmer 23kg, £84.50, Annalong farmer 23kg, £84.00, Ballyculter farmer 23kg, £84.00, Annacloy farmer 22kg, £84.00, Ballygowan farmer 23kg, £83.00, Ballynahinch farmer 23kg, £83.00, Killyleagh farmer 23kg, £82.00, Downpatrick farmer 23kg, £82.00, Ballyculter farmer 22kg, £81.50, Dromara farmer 23kg, £81.00, Saintfield farmer 21kg, £80.00, Ballyward farmer 23kg, £80.00, Crossgar farmer 23kg, £80.00, Castlewellan farmer 22kg, £80.00, Clough farmer 22kg, £78.00, Strangford farmer 22kg, £78.00, Downpatrick farmer 21kg, £77.00, Glassdrummond farmer 21kg, £76.00, Lisburn farmer 21kg, £75.00, Raholp farmer 21kg, £74.50, Downpatrick farmer 21kg, £74.00, Ballykinlar farmer 20kg, £71.50, Ballykinlar farmer 20kg, £71.00, Loughinisland farmer 20kg, £68.50 and Glassdrummond farmer 20kg, £65. FAT EWES: Rossglass farmer £90, Downpatrick farmer £84.00, Carrowbane farmer £75.00, Dromara farmer £75.00, Ballynahinch farmer £70.00, Loughinisland farmer £70.00, Castlescreen farmer £70.00, Saintfield farmer £70.00, Crossgar £70.00, Newcastle farmer £70.00, Downpatrick farmer £63.50, Ballykinlar farmer £61.00 and Dromara farmer £52.